March 18, 2015. This post appeared in the Elder of Ziyon blog. It’s the Morning After in Israel, and it’s a beautiful day for several reasons. The weather is great. And although pre-election polls showed Yitzhak (Buji) Herzog’s “Zionist Union” (Labor Party) ahead by as many as 4 seats, exit polls released at 10 PM showed a dead heat with Netanyahu’s Likud. This morning with 99% of the precincts reporting, the Likud was up 30 to 24 — and when soldiers’ votes come in over the next few days the gap is expected to widen. Although coalition negotiations are yet to come, it’s as close to certain as anything can be in politics that Netanyahu will be the one to form the next government. The polls were all very wrong. Recently I went to an excellent talk about the coming election by Times of Israel analyst Haviv Rettig Gur. He mentioned the phenomenon of election surprises, which seem to have become a regular feature here. The Pensioner’s Party that came from nowhere to get 7 seats in the Knesset in 2006 and the unanticipated second-place showing (19 seats) of Yesh Atid in 2013 are examples. “But,” he said, “the surprises never help the right wing.” So much for that theory. Rehovot, where I live, is a bellwether for the nation, sometimes called “Israel’s Ohio.” It’s a mixture of almost all the Israeli Jewish subcultures (few Arabs live here). Russians, Ethiopians, Yemenites, South Americans, Moroccans, English-speakers, descendents of some of the first Jewish immigrants to Israel, scientists from the Weizman Institute, Haredim, Modern Orthodox and secular people, even a thriving Masorati (conservative) congregation. The volunteers (and paid staff) of the US-funded V15 organization that was “non-politically” working to defeat PM Netanyahu were everywhere in recent days. Their stickers were on light poles, their tables and free pizza in the little squares in my neighborhood. Drivers saw their signs at every junction. Their ‘suggested’ posts clogged my Facebook timeline, and their ads appeared before YouTube videos and anywhere banner ads could be purchased. There was big foreign money against the PM (yes, I know about Israel Hayom, but that is just a newspaper, the only one of the three major papers that supports him, not a small army of political operatives), and US President Obama made it clear that he wanted to see regime change in Israel. The Israeli media (all the radio and TV stations lean left to a greater or lesser degree) was full of talk about how the Likud campaign was coming apart. The foreign media, too, was all about life after Bibi. Election Day started out well. After I ran the gauntlet of anti-Bibi leafleters, an older man coming out of the polling place looked at me, smiled, raised his fist and said ‘machal!’ (the ballot symbol for the Likud). I responded in kind. So what happened? 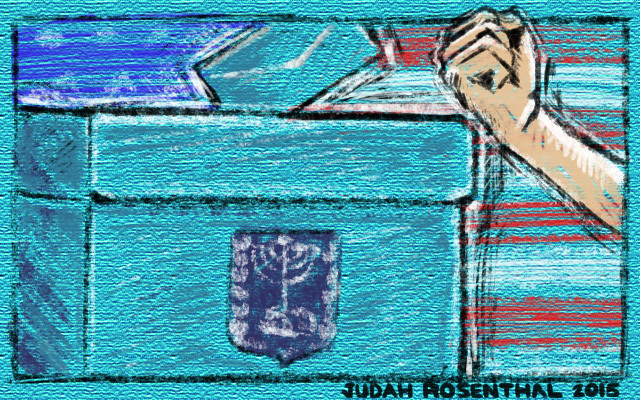 The Zionist Union and farther left parties got more or less what the polls predicted, except that the Joint Arab List benefited from a slighter greater turnout in the Arab sector. The right-wing bloc overall has been ahead since the Second Intifada. Most Israelis simply don’t trust the Left any more. But why did so many people who were expected to vote for other right-wing parties move to the Likud? Bibi’s last-minute strategy was to appeal to the right-wing bloc to abandon the small parties and vote for him. Many Israelis find him personally off-putting — they think he’s dictatorial, a demagogue, has expensive personal tastes, etc. But compared to what the Left offers, it’s no contest. There will be no Palestinian state, Bibi said, while Buji promised to restart talks with the PLO. Only a small minority of Israelis think this would be productive, and understand that it would mean pressure on Israel for concessions like releasing prisoners, freezing construction in Jerusalem, etc. When faced with the alternative, these voters made the safe choice. I think there was something additional here. Just before the election it became known that the Worldwide Threat Assessment, produced by US intelligence agencies under the guidance of Obama appointee James Clapper, dropped Iran and Hezbollah from its list of entities considered terrorism threats. This is more evidence, if any more is needed, that the Obama Administration is pursuing a policy of alignment with Iran. Whether it is primarily because Obama thinks he can pacify Iraq on the cheap, or if he has other, darker motives, isn’t clear. But the friend of our enemy can’t be our friend, and Israelis are uneasy with Obama. At almost the same time, it was published that the US has failed to renew an agreement with Israel that guaranteed Israel’s oil supply in the event of war, an agreement that was first signed in 1975. Probably not a big deal, but just another reason for Israelis to wonder about whether they could depend on the Obama Administration if the chips were down. As I wrote recently, Herzog and Livni made the relationship with the administration one of the main issues in the campaign, and the impression is that they would try to ‘improve’ it by doing whatever Obama wants. Buji said in regard to the P5+1 – Iran negotiations, “I trust Obama to get a good deal.” A shocking statement, really, and one that might represent the greatest policy divergence between Herzog and Netanyahu. I think that what happened was that as the elections approached, Israelis started noticing how hard they were being pushed toward the Zionist Union, how obsequious its leaders were toward Obama, and how dangerous the policies of Obama Administration really are toward the State of Israel. I think that they were very uneasy about the clear conflict of interest shown by Herzog and Livni, whose campaign received a huge boost from groups funded by foreign money, including the US State Department and S. Daniel Abraham, an American billionaire with close connections to the Democratic party. I think they were beginning to ask themselves if someone was trying to buy a government for some pizza.